Doctors used to tell pregnant women that they should avoid physical exercise at all costs. But that's a thing of the past. Current medical thinking is that exercise is good for pregnant women and their unborn babies – with the proviso that they should avoid intensive training in the last months of pregnancy. According to sports scientists at the Spanish Universidad Politecnica de Madrid, there’s nothing to stop pregnant women following a light fitness programme right up to the birth. The researchers published the results of their study in the American Journal of Obstetrics & Gynecology. They did an experiment with 142 women, half of which were not physically active before or during their pregnancy. The other half were not active before pregnancy, but started exercising from the third month of pregnancy under supervision from a trainer. The women went to the gym three times a week, where they did a short warming up, followed by training using weights that weighed no more than 3 kg. They did abdominal curls, biceps curls, triceps extensions, lateral raises, seated bench press, seated lateral row, lateral leg elevations, knee extensions en leg curls. "Supine postures and exercises that involved extreme stretching and joint overextension, ballistic movements, jumps, and those types of exercises that are performed on the back were specifically avoided", the researchers write. "To minimize cardiovascular stress, we specifically instructed participants to avoid the Valsalva maneuver." After a cool-down the women went home. The women continued training right up to the birth. Afterwards the researchers looked at how their subjects' birth had gone, and found no noticeable differences between the two groups. The training programme had no effect on the unborn child either. 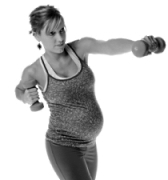 So appropriate fitness training is safe for pregnant women, the researchers conclude. Previous studies have shown that women who run or do aerobics have less chance of complications if they continue light-level training during pregnancy. Am J Obstet Gynecol. 2009 Dec; 201(6): 590.e1-6.